Natalie's Cakes & Bakes are based in Wallasey Village and provide home baked cakes for all styles of weddings. They are delicious and beautifully decorated cakes designed to your specification. Natalie prides herself on cakes that not only look good but taste good too. Natalie's Cakes & Bakes hold a 5 star Food Hygiene and will have different flavoured cupcake samples to get your mouth watering at the Red Event Chester Wedding Fayre on Sunday 28th January. Natalie's Cakes & Bakes are offering a delicious 10% Off Your Wedding Cake for on the day bookings at the Macdonald Craxton Wood Wedding Fayre, Chester next Sunday! Natalie has also donated a complimentary box of 12 cupcakes to our on the day free prize draw. Make sure you watch our catwalk shows at 1:30pm & 3pm when our winners will be announced. Visit Natalie's stand, take a peek at her stunning and unique cakes, discuss your Wedding Cake design ideas and receive your discount!! Whether your looking for your Wedding Cake or looking for Wedding Ideas & Inspiration we will have it all at our Chester Wedding Fayre next Sunday! Free entry and everyone is welcome! That Cakes The Biscuit is a small family run baking business near to Delamere Forest, Cheshire. They started out baking for Family & Friends and turned their dream into reality in 2013. They specialise in Cakes, Cupcakes, Brownies and Traybakes, wedding favours, cake jars, a variety of chocolate products and bake your own cookie mixes. They have a 5* hygiene rating and pride themselves in using only the finest ingredients! They are offering an amazing 10% discount on Wedding Cake bookings if a deposit is paid on the day of our Chester Wedding Fayre at the Brook Mollington Banastre Hotel & Spa, Chester which will be held on Sunday 17th September. Whether you are looking to book your Wedding Cake and see more of 'That Cakes the Biscuit' cake designs or for more Wedding Ideas and Wedding Inspiration we will have it all at our North West Wedding Fayre. Free Entry and enjoy a glass of bucks fizz & canapes upon arrival. Thank you for coming to the Holiday Inn Ellesmere Port Wedding Fayre on Sunday! We had a blast and hope you enjoyed planning your special day! Thank you to everyone who attended our Wedding Fayre on Sunday at the Holiday Inn Ellesmere Port Cheshire Oaks! We had such a brilliant day and hope you enjoyed planning your special day! Guests enjoyed a drink upon arrival! Our models backstage before our catwalk show modelling Stunning Dresses from The Wedding Collection... We loved the red dress definitely a head turner! So many amazing dresses from The Wedding Collection! Say Cheese! Selfie Mirrors by Pixel Booth! Bling Bling! Stunning Wedding & Engagement rings from Rigby Jewellers! Lots of different venue dressing to choose from at Megan-Louise Events! That Cakes the Biscuit, their cakes where yummy to taste and to look at! Look the part with Grooms wear from Attires Menswear who also featured on our catwalk shows. 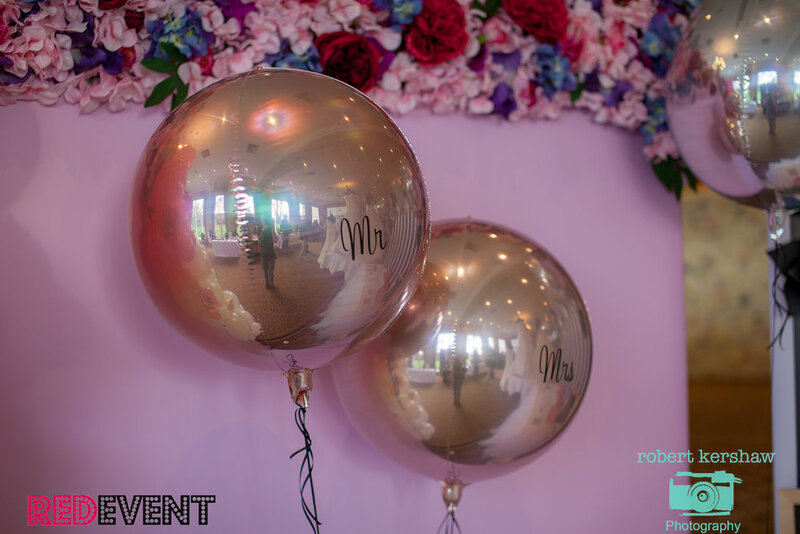 Stunning Venue Decor From Covers & Bows Venue Dressing, we loved the pinks and golds and especially the funky pineapple! Sam Lyon Serenading our guests in the Manfred Suite! Luxury Candy Carts and yummy treats from Glamour Booth! If you couldn't make it to our last wedding fayre or you are still looking for Wedding Ideas, your wedding venue or for more Wedding Suppliers then come along to our Wedding Fayre on Sunday 19th March at the Brook Mollington Banastre Hotel & Spa, Chester. With 30+Exhibitors, Catwalk Shows, a bridal dress sale with changing rooms, arrival drink and canapés, special offers, live music and so much more you won't want to miss it! Free Entry! Not booked your wedding cake yet? That Cakes the Biscuit are offering 10% off bookings when a deposit is paid on the day of The Holiday Inn Ellesmere Port Wedding Fayre this Sunday! They are offering an amazing 10% discount on Wedding Cake bookings if a deposit is paid on the day of our North West Wedding Fayre at the Holiday Inn Ellesmere Port. They are ALSO donating a prize to our on the day free raffle of a box of 6 cupcakes to one lucky Bride or Groom-to-be! Winners will be announced during our catwalk shows at 1:30pm & 3pm so be sure not to miss it! Whether you are looking to book your Wedding Cake and see more of That Cakes the Biscuit cakes designs or for more Wedding Ideas and Wedding Inspiration we will have it all at our North West Wedding Fayre. Free Entry and enjoy a glass of prosecco and bucks fizz upon arrival.